Vimeo has long been a favored site for visualists sharing their work, but while sites like rival video host Blip.tv and photo sharing site Flickr added an option for Creative Commons licensing, it’s been conspicuously absent on Vimeo — until now. 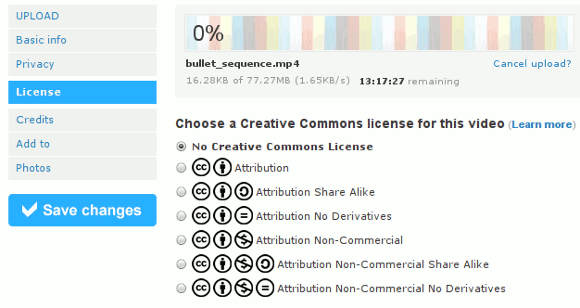 Now, when you upload video files to Vimeo, you’ll see options for all the major CC license types. That means you can not only provide a CC license, but choose how you want your work to be used — whether people are allowed to remix it, use it for commercial uses, and so on. It means that while you still retain the copyright for your work, you can allow other people to distribute it, remix it or use it for a new purpose, commercial or noncommercial. All of this while still requiring that they credit you for the original work. For visualists, I think it’s big news. I’ve seen entire sets made of ripped-off videos from Vimeo. Now, for those willing to take a different path, you can assemble visual sets using work for which the creator actually wants you to remix and reuse. If creator intent is important to you, can now honor that intent. Wider distribution when you want it. If visuals are a promotional tool (like the Flying Lotus and Matthew Dear vids I just posted), you can actually encourage people passing them around using tools like torrent. And you can do the same with, say, visual reels or video you shot of projection mapping, and so on. Remixes when you want them. If you want to upload footage and see it in someone’s live visual set, you now have the option of using Vimeo as your tool. Ditto if you have an artist who wants video remixes of a music video, and so on. The “if you want” is the important part. If you prefer to retain your copyright, you can. The problem has been that people assume that anything uploaded to the Internet is fair game – which is true, so long as you don’t care about artist intent, credit, or authorship. Once the CC badges are there, it’s blatantly obvious what people want or not. The uploader still remains the weak link – it’s easy for someone to upload content that isn’t actually CC-licensed as their own, but that’s an issue with the Web, not with CC licenses per se (because they can do the same with copyrighted works). Take Away Show #100 _ SOEMA MONTENEGRO (part 2) from vincent moon / temporary areas on Vimeo. I know that visualists using footage has been a dicey topic. Because audiences for live visualists usually aren’t terribly discriminating, and only fellow VJs know what you’re doing, there are a lot of frankly boring sets. But if readers on CDMotion are ready to join in the crusade, I’d love to see people voluntarily uploading remix-ready video footage and imagery, and talented visual artists working to truly remix that into something unique, not just dropping it in a set and cross-fading. Who’s with me?